June was a slow month for me. Everyone talks about how fast it went on Twitter and Instagram but I found myself having more time to pamper and relax. It was quite a chilled-out month. My first favourite is something I have absolutely fell in love with. I’d read online about the benefits to skin and hair that Coconut Oil has; and when I saw it on offer in Superdrug I couldn’t help myself – the tub is huge! Not only does it smell AMAZING, but it’s SO good for you. It’s a great moisturiser, and I genuinely feel like it’s made a difference with my acne scarring. 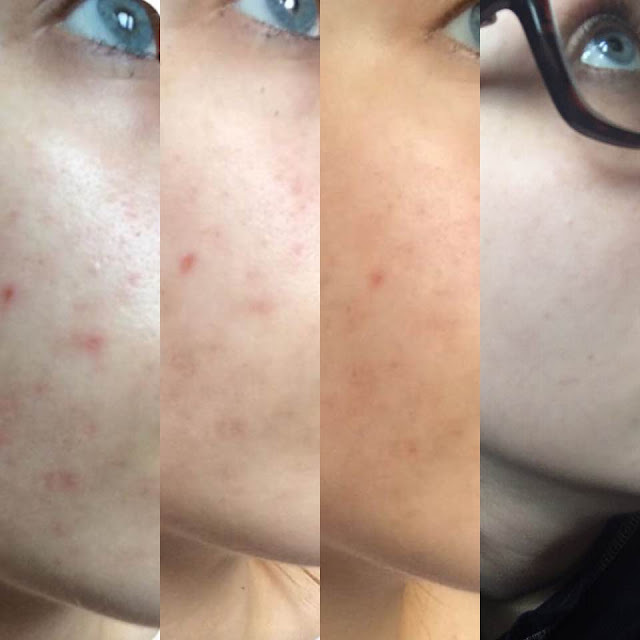 I’ll pop a photo below of my skin comparisons from 2 years ago, to June 2017. So, although I’ve been using Coconut Oil for some time; with the recent heatwave in the UK with temperature reaching as high as 28c, I feel like this oil has SAVED my skin from becoming dry and scaly. Total lifesaver. My next favourite was actually something I bought fairly recently. I’ve used the small sachets of Montagne Jennesse 7th Heaven Masks for ages – those little £1 packets you can grab in your local Asda or Tesco! However, I do have problem skin, as mentioned above; so I wanted a tea tree mask just to use once or twice fortnightly when my skin is feeling a little more problematic. It works a dream, my redness goes down almost as soon as I take the mask off and my skin feels like a baby’s bottom, honestly! I’ve been getting Birchbox subscriptions for quite a few months, and this is the one item I use almost every single day now. It’s the Pop Beauty eyeshadow trio in Champagne Mocha. The colour payoff for this palette is awesome, and it blends beautifully. I use the Sigma C06 blending brush which I also got in the same Birchbox. You’ll probably find all my selfies over the last 2 months use all 3 of these colours on my eyes. It’s so pretty! The Soap & Glory Archery eyebrow pencil in medium brown is a total HOLY GRAIL for me. Honestly is the best eyebrow product I’ve ever used, and I have tried a fair few of them. It’s a little pricier than the usual Boots brands, but it’s so worth it. Yes, I’m cheap if I consider Soap & Glory pricey!! It’s a twist pencil, with a very fine nib for realistic hair strokes, and the colour matches my brows well. It comes with a brush on the other side to comb through your brows, which is handy to have on one pencil. 100% recommend! I have two lip products I’ve been loving. Anyone who knows me, knows I always wear a red or dark lip. That’s my thing. But I decided to try something a little different when I bought the Sleek Matte Me in Birthday Suit. This matte lip cream has genuinely become a firm all-time favourite, and I’ve found myself throwing it on an awful lot – probably most days! It’s very matte, and not too drying. Though I do find I need to moisturise my lips a little before I use it (coconut oil again). It lasts almost all day, and doesn’t wipe away when I eat, so that’s a huge plus! The second lip product is a red lippy of course. BUT this one is the Rimmel Kate Moss Matte Lipstick in 110, which is a bright coral, so it’s not entirely red. It’s so pretty to wear on a sunny day, and it suits my skin tone perfectly. As you can tell by the photo, the lipstick is quite worn down, so I’ve wore it plenty. You can’t really go wrong with Rimmel Kate Moss lipsticks to be honest though, my collection is largely made up of them! Onto the more generic favourites! Two new discoveries in June for me. The first one was a birthday present I got in April from my friends, which I only just got around to trying out. I’m slow, I know! I love lighting candles, and I got a Yankee Candle Wax Burner with Wax Melts and I was so surprised at how much the gorgeous scent filled my room. It lasted for such a long time too, I think it may have been better than the usual Yankee Candle in a jar. I used the black cherry scent first and my goodness, it was to die for! June has been a real Netflix month for me. One of Eric’s colleagues recommended a TV show for us “millennials” saying we’d love it, and we totally did. I’ve finished the whole first season of Crazy Ex-Girlfriend and I’m obsessed. It’s a hilarious comedy but it’s also a musical, and not only are the songs great but they’re so funny. They’re available on Spotify and I liked them that much I’ve been singing along to “I gave you, a UTI” in my car. I’m a few episodes into season 2, so I’ll definitely let you know my thoughts about it on Twitter no doubt! So that’s some of the things I’ve been loving in June. It’s been such a sunny, happy month for me, and I already can’t wait to write my July Favourites so I can talk some more about Crazy Ex-Girlfriend and I already have some new products to try!